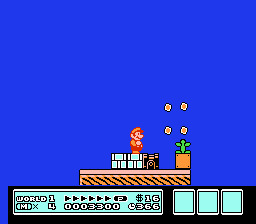 This hack is a one world hack, filled with 28 new levels, 3 Power Up Pipes, and 2 different types of Mushroom Houses, and a Level Re-Do Spade “game”. There are TWO paths in this game, that allow the user to take control of his/her own destiny. The bottom path is the easiest, and the top path is very difficult. 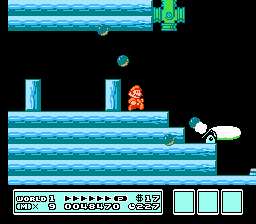 Both paths have their very own last levels, and both with their own Power Up Pipes. 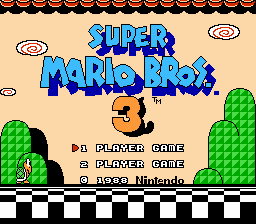 Take control of Mario and beat either path, or tackle both paths to bring the game to completion. 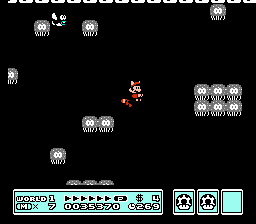 Throughout the hack there are clever rooms or jumps, but there is a lot of filler and repetition in between. 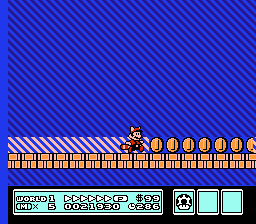 The hard path mostly consists of fighting the first Koopa kid a dozen times, often 2 or 3 of it at once. The easy path does show some concepts of level design but there’s something missing, besides the ceiling. There are a total of 5 Bowser fights, 3 making him dig in a certain area and 2 with the depth of blocks doubled, neither style making him harder at all. The underwater one was interesting at first, but as soon as a you get under the water, its a normal fight. While its already mildly short at 28 levels, I can imagine it could have been a lot better if it were half as long.